Pizzoccheri, Teglio, cheese and… what else? Among the tastiest dishes of pasta in Italy, we cannot but mention Pizzoccheri, the symbol of the traditional cuisine of Valtellina, a well-known valley in the Lombardy region, bordering Switzerland. What kind of pasta are they? 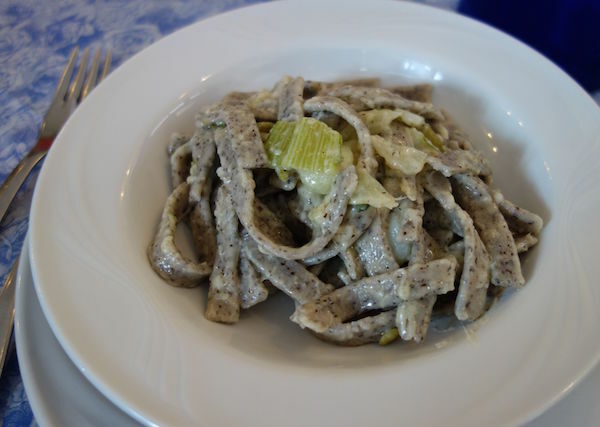 Pizzoccheri are a type of short tagliatelle (but don’t call them that way), a flat ribbon of pasta, made with 80% buckwheat flour and 20% wheat flour. They are generally cooked along with greens (usually Savoy cabbage), and cubed potatoes. This mixture is layered with pieces of the local cheese (generally Valtellina Casera) and Parmigiano cheese, and dressed with garlic and sage that are lightly fried together with butter. Pizzoccheri are really a special dish, something you cannot find in other parts of Italy. But the first question is: where do their name come from? What’s their story about? Born as a peasant dish, prepared from a few simple ingredients and considered among the most interesting dining experiences in the whole valley, Pizzoccheri have an uncertain origin. The origin of the name is uncertain too; according to some sources the word Pizzocchero comes from “piz” or “pit”, meaning “small piece”; someone else report it has Longobard origins, probably related to the word “bizzo”, that means bite (but it is considered unlikely). According to the Count Sertoli Salis, an historical figure of Valtelline, Pizzocchero should refer to people considered “churchy”. Etymology aside, some texts report that Pizzoccheri were enjoyed (and with great satisfaction) already during the XIV century, when people had begun to make extensive use of buckwheat flour. Ortensio Landi, in one of his works – kind of food inventory – printed in Venice in 1548, mentioned “pinzocheri” (their former name) and report even the name of their inventor: Meluzza, a woman from Como very good at cooking. According to Giuseppe Barretta, researcher of the Braidense National Library, buckwheat had been used in that area since the XIV century, along with other cereals like millet, barley, panic, oats. Mrs Merluzza add more taste to this cereal adding cheese, butter and vegetables. Even in the second half of the 1800, there are texts that speak of Pizzoccheri. The most precise information relating to the Pizzoccheri are to be found in a manuscript by Bartolommeo Besta, a doctor who conducted a study on the food habits of the Valtelline farmers: Pizzoccheri were among the most common dishes of the area. The poorest farmers, who didn’t have a table to roll the dough, used to take small pieces of dough in their hands and to give them the form of dumplings with a table spoon. Homeland of pizzoccheri has always been Teglio, a village high in the valley. According to the tradition there is a place in Valtelline that is bound to the tradition of Pizzoccheri above all: the village of Teglio. Located in the mid-valley, historically one of the most important centers of the valley, Teglio is considered the official hometown of Pizzoccheri. It is here, in an area specially devoted to agriculture and in particular to the cultivation of “furmentùn“, the local buckwheat, that Pizzoccheri were born. Every year in summer, some important events related to Pizzoccheri take place in Teglio: in July they celebrate Sagra dei Pizzoccheri (a country-festival devoted to Pizzoccheri) and in September Pizzocchero d’oro (“Golden Pizzocchero“), that draws crowds of admirers from all over the region and even beyond. But the bond Teglio-pizzoccheri is much stronger. In Teglio was created the Accademia del Pizzocchero (Academy of Pizzocchero), a free association whose aim is to help enhance, defend and increase the knowledge of Valtelline food – especially Pizzoccheri – and wine. Pizzoccheri are nowadays protected by Accademia del Pizzocchero, that codified its recipe and at the same time enhanced the promotion of its conception both in Italy and abroad. As the statute of the association reports, “Pizzoccheri belong to our history”. But how to cook Pizzoccheri di Teglio? Accademia del Pizzochero has the answer. Despite once they were exclusively handmade nowadays Pizzoccheri are sold as dry pasta already wrapped and ready for cooking. Savoy cabbage is often replaced with spinach or green beans and some chef also adds truffle. If you want to taste the original taste consider that the dough is easy to make also at home and no great effort is needed. Do you think Pizzocheri are tasty, but perhaps too caloric? Well, you need to think again. As you probably know red wine contains a substance (called resveratrol) which helps to fight free radicals; this substance is not only a prerogative of wine, but also of buckwheat flour, the same flour used also for Pizzoccheri. Some Pizzocheri combined with a good glass of red wine (maybe from Valtelline) cannot but do well. Looking for the recipe of Pizzoccheri? Subscribe to the #FoodIS newsletter and download the recipe! I live in Bergamo. I am “a citizen of the world”. I am a communication and social media specialist, translator and blogger. Traveling is my greatest passion. I love unusual destinations and non-touristy places.